I have two passions: diving and photography. 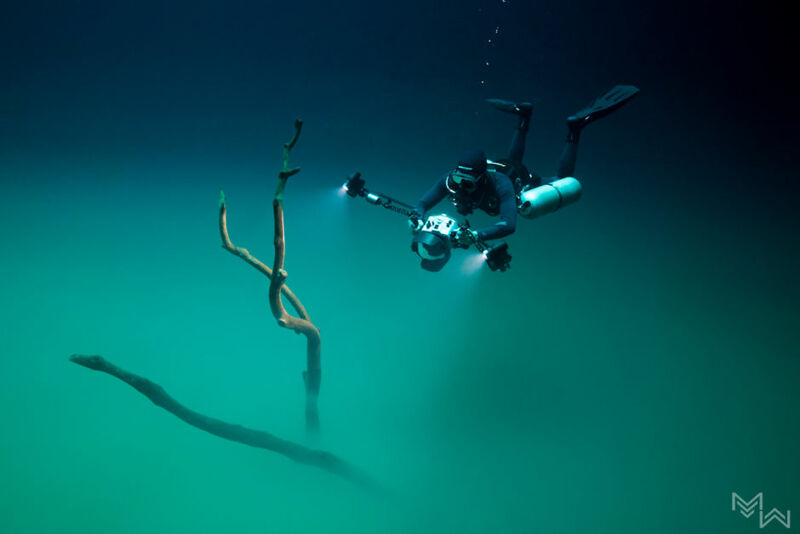 Recently, I got to hang out on Mexico’s Yucatan Peninsula and combine both passions in an exploration of the underwater realm of the cenotes (pronounced, “say-no-tays”) that dot the area. Cenotes are essentially freshwater sinkholes, where the limestone and earth has caved in to reveal crystal clear waters and unique ecosystems. 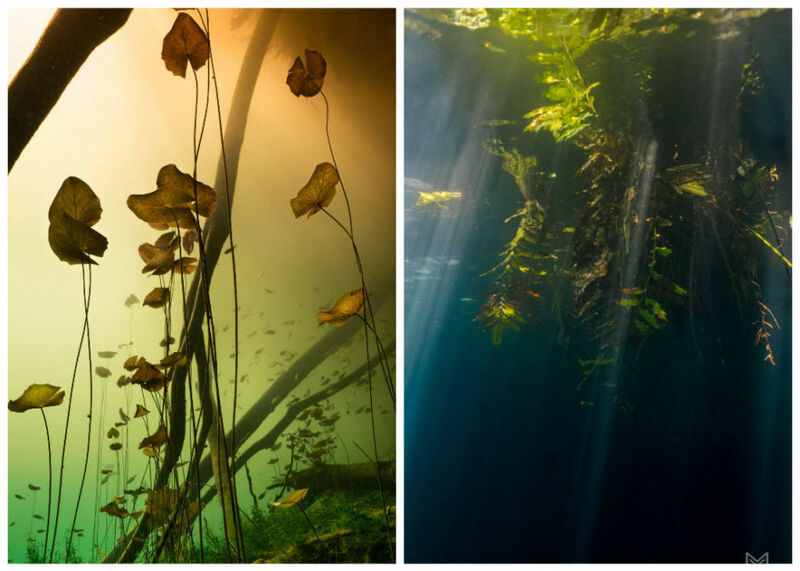 I’m used to taking my camera underwater, but what I found inside the cenotes was a whole other world. Here are a handful of images from my journey beneath the surface. Close to the town of Chemuyil lies Dreamgate, a deep sinkhole full of bright blue water inside a cave full of bats and swimming geckos. Since this dive is considered more advanced, it's less often visited, so our group of three were the only divers here this afternoon. After exiting the dark cavern zone, I explored different rooms filled with stalactites and stalagmites, and turned around to see a view of the platform where we entered naturally framed by massive stalactites hanging from the ceiling. 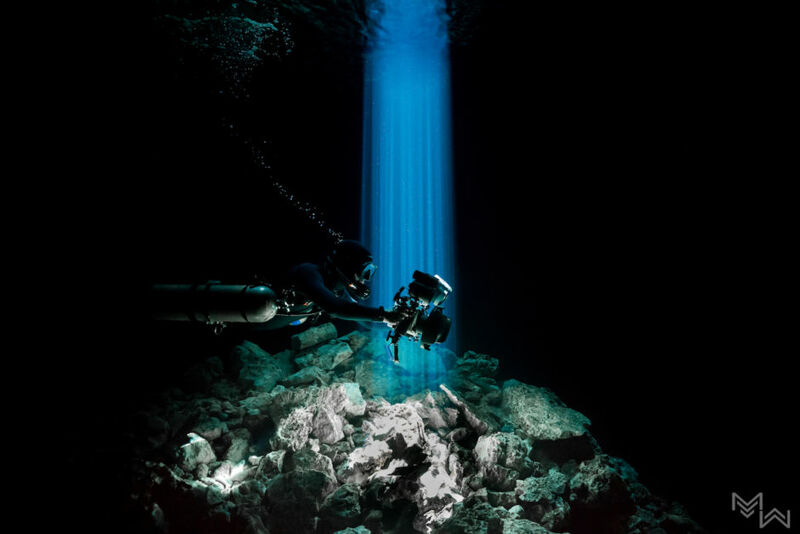 Photographing light rays underwater is a challenging task. 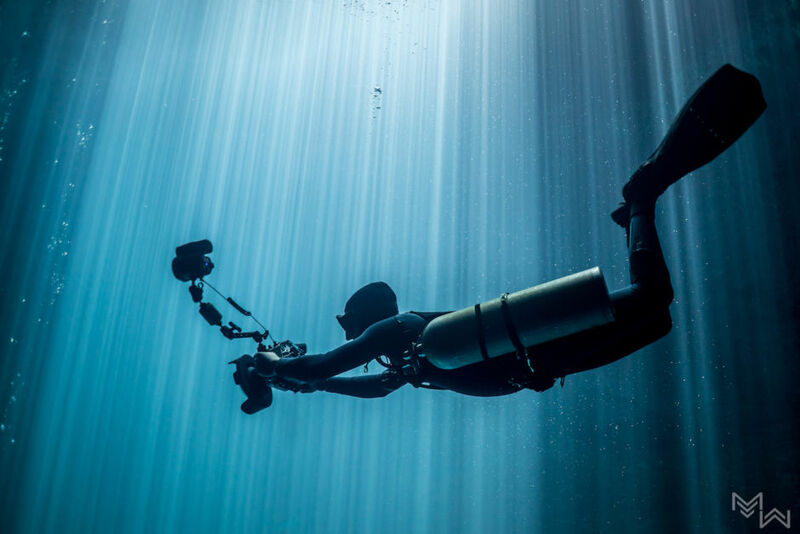 Fighting camera settings in a dark environment, without a tripod, two tanks strapped to your body, controlling your own buoyancy so as not to damage the environment, and the close quarters of a cenote gave me a new appreciation for this kind of underwater photography. Cenote Aktun-Ha is located close to the highway near Tulum. Once discovered, it was common for locals to stop here and use the fresh cool water to wash their cars; hence it’s also known by a nickname: Carwash. 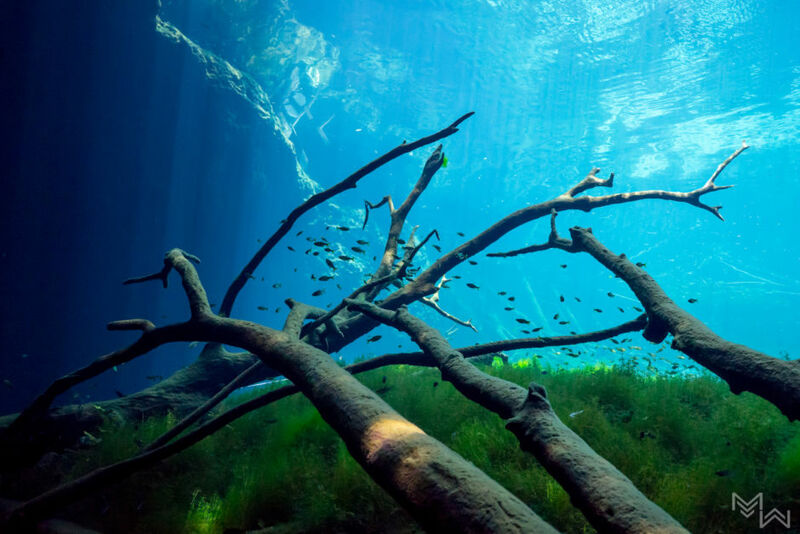 When cenotes became more popular with snorkelers and divers, it was turned into an attraction with an admission fee. Carwash is one of the cheapest cenotes to visit, and is easily done by local transit or taxi on your own. To swim it will cost 50 pesos (about $2.50 USD); to dive 200 pesos (about $10). Water lilies, small crocodiles, freshwater turtles, and crystal clear water make this easily one of my favourite spots in the area. At each end, a small underwater cavern opens up into a cave system. The opening of these caverns gave some of the best photo opportunities, light pouring into dark places. I snagged this photo on a single breath while freediving into the cavern. Cenote Aktun-Ha (Carwash) usually has such clear water that you can see the fish from above the surface, but after a heavy rain, tannic acid from the soil leaves a cloudy green layer close to the top; only divers who can pass below the surface get to see the clear water beneath. We were the first to arrive early in the morning, hoping the previous night's rain would give us a chance to experience this rare phenomenon. The green colour is all natural, and light from the sun makes it glow (this isn’t a photo edit). This shot is from inside the cavern zone looking out at the tree branches, freshwater fish, and my dive buddy. When going on a cavern dive in the cenotes, you pass from pocket to pocket (like moving room by room) where different sinkholes have exposed the underwater cave system below. On this dive, my partner and I surfaced for a conversation in one of these “rooms” and found the sky was visible through the trees and vines above. In these places, huge beams of sparkly light pour in and are almost brighter below the surface than above. 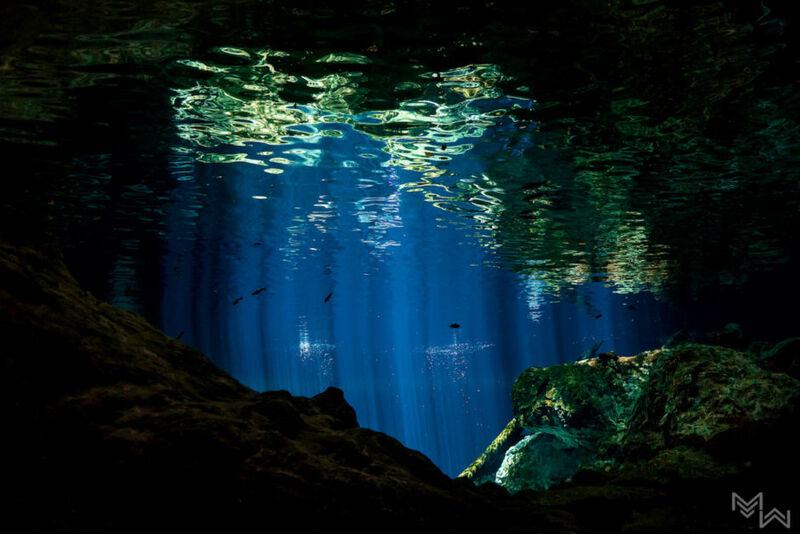 Many cenotes are quite shallow and tend to spread outwards rather than down. 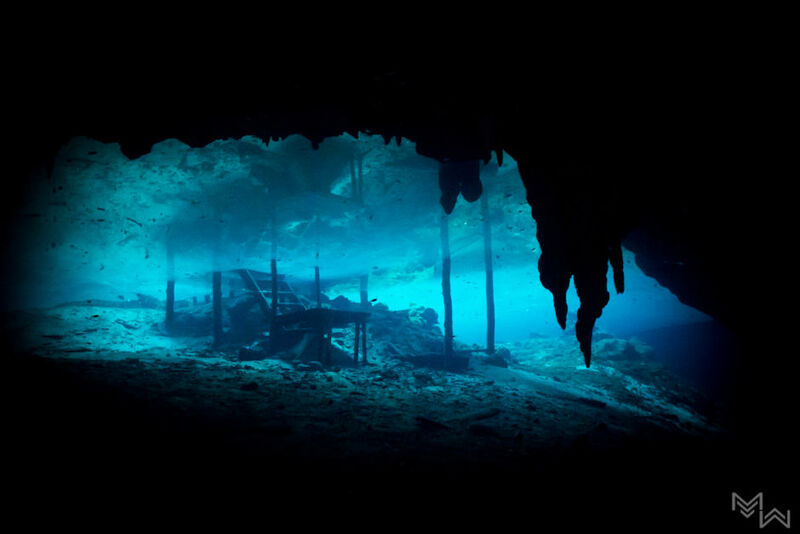 Cenote Angelita is one of the rare dives that is a deep drop. Those who dive it descend into a thick layer of hydrogen sulfide that hangs out at about 30 meters. The gas gives off a strong smell of rotten eggs—so strong it can be smelled even underwater. We passed through this layer and discovered, under it all, the sunlight is blacked out. Yet, when we turned on our torches, the water was astoundingly clear, making it one of the more unusual dives I've ever done. Be prepared to pay 500 pesos ($25 USD) extra to bring a camera here. Cenote El Pit is another uniquely deep, and the cave system doesn't begin until you reach the bottom at around 25 meters. The steep steps down to this cenote mean tanks need to be lowered by rope and pulley from above directly into the water. About 12 meters into the descent is a halocline where the fresh and salt water mix. The denser salt water below changes the buoyancy and makes it hard to see until passed through. The light filtered through the trees above produces beautiful rays that glitter and sparkle, only adding to the surreal nature of the experience. Most don't dive the cenotes for the fish life, since they're not incredibly impressive compared to the tropical species found in the nearby Caribbean. But for fish nerds like myself, their bright colors and unique behavior make them a unique part of cenote diving. In darker cavern areas, some fish were white and blind, relying on other senses to find prey. Some fish in the shallows would crowd around my exposed skin, hoping to get a free meal. The small catfish that hung around light beams, as in this photo, would dance around the rays in search of prey. 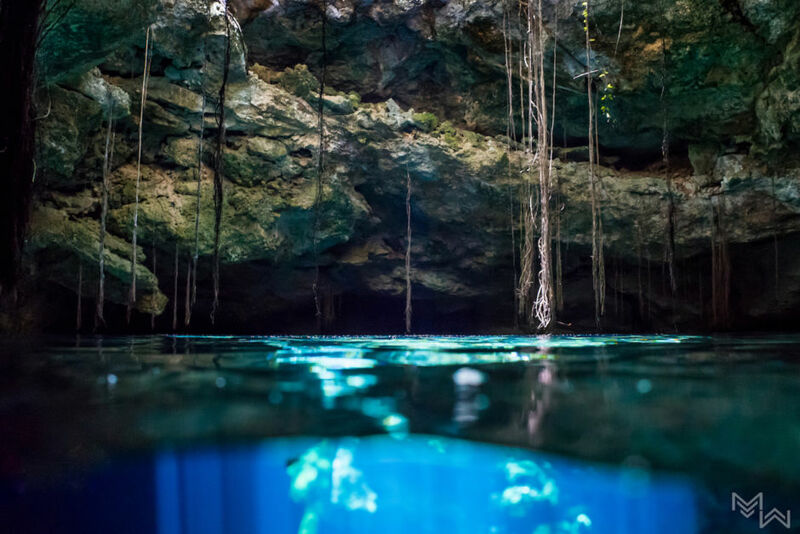 From the greens and reds of tannic water to crystal clear visibility, the colours found in the cenotes will amaze you. A kaleidoscope seems to fill every space. Inside cavern areas where only your torch illuminates the limestone walls, you'll find the bright colours of stalactites and stalagmites. Closer to the surface, the water lilies mix with the red earth and green algae. Vines and tropical trees from the jungle surround these sinkholes, giving each a unique ecosystem. 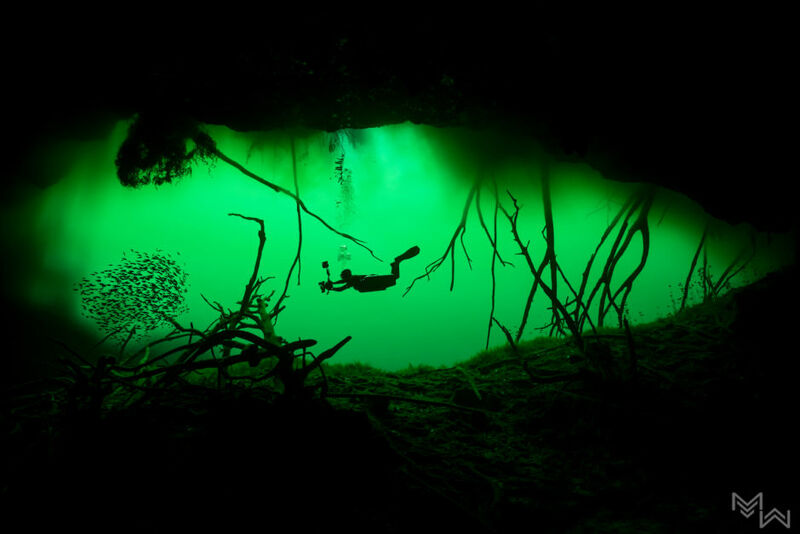 Many cenotes were only discovered by accident, while others were scouted out by plane deep in the jungle. It’s no wonder these were sacred places for the Mayans. The cenotes feel otherworldly and very special, like an actual oasis in the jungles of the Yucatán. This post is proudly produced in partnership with Visit Mexico.